Logic Express 7, Apple's feature-packed software for music composition and production, delivers affordable, professional-quality audio and MIDI tools. Combining a core collection of software instruments and effects with professional-style recording, editing and mixing, it gives students and musicians more power and possibilities when they're ready to take their music to the next level. Create your own music using an advanced spectrum of features and tools for computer based music production! Logic Express provides a step up from GarageBand for aspiring musicians, producers and composers without breaking the bank. With the same flexible layout as Logic Pro, you can dive deeper into the creation and manipulation of audio and MIDI. Logic Express lets you produce a convincing demo of your band, create a remix of your favorite track or score QuickTime movies. This affordable virtual studio integrates a rich feature set for both music and audio production in one application. In addition to the Apple Loops you're familiar with from GarageBand, you'll enjoy the wide variety of software instruments. These provide, for example, faithful emulations of vintage keyboard classics as well as synthetic sounds, ranging from digital to virtual analog. Composers and music theory teachers will also appreciate the full-featured score editor. Logic Express 7.2 gives you the ability to take full advantage of the next generation of Mac computers. You'll also enjoy enhanced support for prominent thrid-party products, as well as project compatibility with Garageband 3. Logic Express 7.2 is a Universal application, which means it's designed to run natively on both Intel- and PowerPC-based Macs. Stay compatible as Apple continues to deliver new Intel-based systems. Logic Express 7.2 provides support for stereo Rewire objects - and now clearly labels the incoming Rewire streams to reflect the source application. In addition, you can create Rewire objects directly from the Create Multiple option in the Arrange window. The Arrange window in version 7.2 provides visual indication of which tracks are currently active on the control surface. This is especially useful with supported control surfaces that do not provide LCD or other feedback information, such as the newly supported iControl from M-Audio. Users of multi-channel Audio Unit instrument applications will appreciate that Logic Express now has increased output capacity of to 32 mono-channels. Logic Express 7.2 allows you to play back AAC and Apple Lossless files directly - with no need for conversion. This feature ensures project compatibility with Garageband 3 and offers great sonic quality with the convenience of smaller file sizes. Ducker offers automated voiceover volume reduction functionality, known as 'ducking,' on Output or Bus tracks. Speech Enhancer provides a simple option for cleaning up and enhancing recordings made with the built-in microphones. 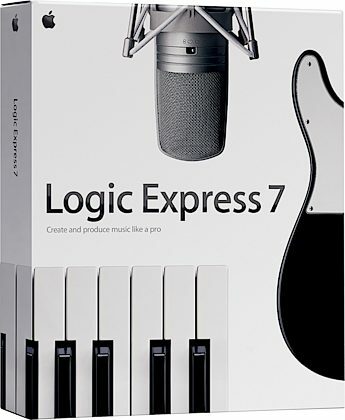 Logic Express 7.2 includes the same Jingles and Sound Effects library that ship with iLife '06. A dedicated Effects button in the Loop Browser makes it easy to view and filter this new collection of sounds. The library includes more than 200 sound effects and 100 jingles. Record a complete band in Logic Express with seamless integration of professional multi-channel audio hardware. In contrast to GarageBand, this enables you to record up to 12 instruments, voices, environmental sounds, effects and more at the same time. Then you can tweak each of these tracks with hyper-precise editors. High resolution audio of up to 24-bit/96kHz, the adaptive self-configuring track mixer as well as 32-bit floating point math provide pro sound quality. Aspiring remixers and electronic music composers can't live without loops. 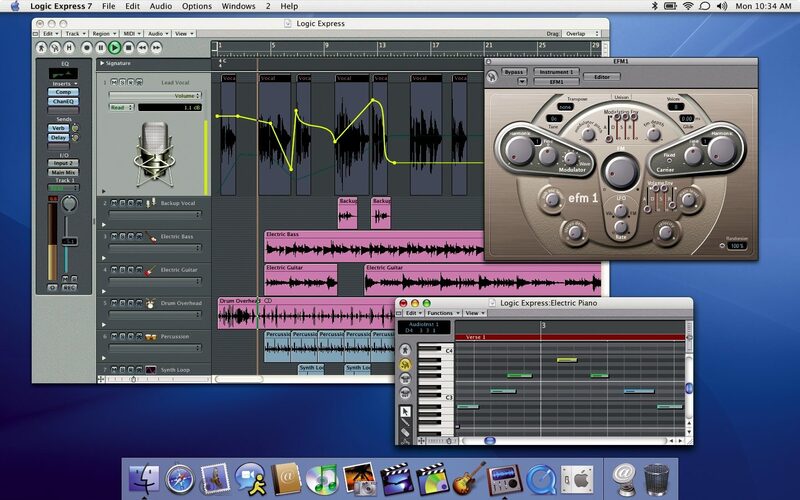 Logic Express offers the familiar Apple Loops browser of GarageBand, hosting a multitude of Apple Loops. Browse quickly through the largest libraries simply by specifying instrument, genre or mood. Preview them instantly at your song's tempo and pitch. Logic Express configures the channel strip automatically for Apple Loops on software instrument tracks. What's more, you can construct your own Apple Loops from conventional audio files such as recordings or bounced phrases produced with software instruments using the Apple Loop Utility. For in-depth sound creations, the range of synthesizers provided in Logic Express proves itself as a priceless resource. Offering a richer set of parameters, they feature precise control on every single shade of the sound. Seamlessly integrated in the Track Mixer, you can effortlessly record and edit parameter changes. The stylish, accessible FM synthesizer EFM1 creates a wide range of digital sounds that characterized the music of the 80s. Generating the sounds from frequency modulation technology, you can play crystal-clear bells as well as deep bass or string pads. The virtual analog beast ES1 provides sounds to enrich every production - from massive basses to rich pads or ultra-sharp percussion. Plug-ins like EQ and Reverb provide precision treatment of your sound. Others, such as the Autofilter and Guitar Amp, invite you to experiment wildly. Songwriters can produce impressive demo songs by incorporating audio recordings, sample-based sounds and virtual instruments entirely on the computer. 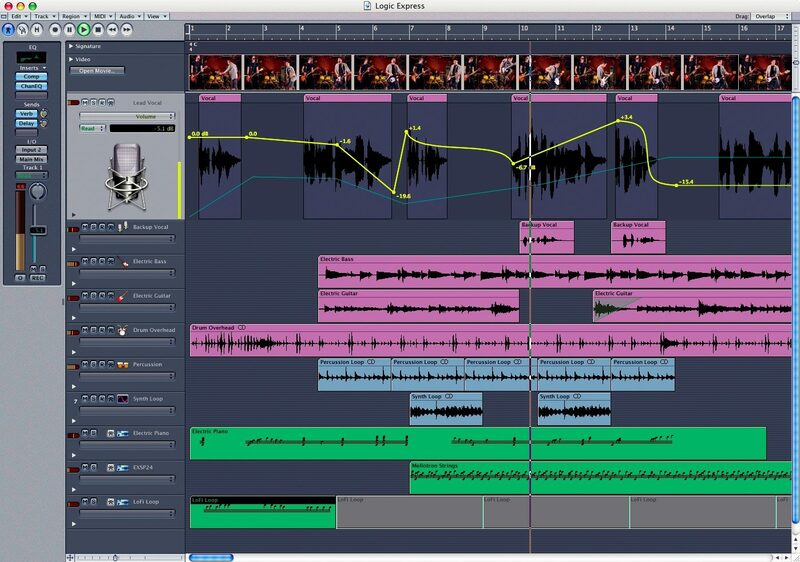 But users will find it easy to share compositions with other musicians in a traditional way with Logic Express as well, since it now houses the full-featured score editor from Logic Pro, for simply stunning results. Import GarageBand projects and take them to the next level. Add any combination of 37 high-quality effect plug-ins to the mix. Select from more than 1,000 Apple Loops to add color to any song. Record control settings for mixing, effects and software instruments. Create, edit and print music scores with comprehensive notation editor. Import and export songs from iTunes to hear tracks on your iPod. Record, mix and adjust on up to 255 stereo tracks on 8 audio buses. Freeze tracks to expand plug-in capacity during production. Enjoy fine control of MIDI editing and processing. Use the Setup Assistant for easy system configuration. Customize your setup with user-definable key and MIDI commands. Layering up to 64 simultaneous software instrument tracks. 40 effect plug-ins, including Guitar Amp, Preset Multipressor, PlatinumVerb, Compressor, Bitcrusher, AutoFilter, Phaser and more. zZounds is an authorized dealer of Apple products. Sound: Pure clean sound and overview. Simple yet a lot of power under the hood. Feature: Excellent soft synths...Guitar amp. Ease of Use: Excellent Quality: Very well programmed...stable! Value: I would pay even more for this. Its a lot that you get for your money. Manufacturer Support: Apple! very good service but they still human beings! The Wow Factor: Its very HOT;) Overall: I am sticking to it for a while and then going PRO! Sound: As far as quality goes, its quite a marvel that they can sell this software at this price. While it may not have some of the advanced features of Logic Pro it still can keep you busy for months on end learning new techniques. Feature: While I do wish that they could have included a few more samples I am very pleased with all of the built in effects that it has, they sound very professional. Ease of Use: Two manuals are included. Both of which are written very clearly, one of the manuals is dedicated to teaching the user about the product, while the other manual is written for people who have been using Garage Band and want to "step it up" and notch Quality: Has not frozen on my PowerBook G4 once, although it can get bogged down with some software instruments and effects from time to time Value: I would highly recommend this to Manufacturer Support: Apple probably has one of the best support centers I have heard of HOWEVER do NOT expect them to teach you how to use this product, and also to troubleshoot Logic Express 7 it costs hundreds of dollars. The Wow Factor: C'mon. It IS made by Apple. Overall: I will definitely be using this for a while until I have enough equipment in my studio to justify me going to Logic Pro. I would highly recommend this to anybody, whether pro or novice.